Sachin tweeted this today at 4pm(April 15) few hours before the IPL T20 match against Kochi Tuskers at the Wankhede Stadium. "... He has carried India on his shoulders for the past 21 years... its time we carried him on our shoulders..."
He said this after Kohli along with Yusuf Pathan and Suresh Raina took Sachin Tendulkar on their shoulders to circle the Ground. Sachin has faced Brad Hogg 21 times after this incident, and Hogg - never able to pick up his wicket. Another best example would be the way he Adapted to the T20 world, scoring a Double century ... the list goes on forever. 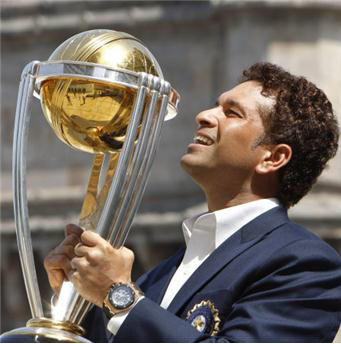 Sachin is considered as the God of Cricket, where Cricket is considered as a Religion in the country. I don't think there would be any better way of respecting the Sport Idol. Share the incident, which you think makes Sachin the God of Cricket.